This is the "box" that holds all of the d20 System Products that are compatible with D&D 3.5 and any other d20 RPG of that era. 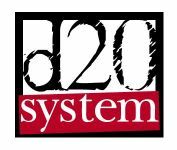 We have other boxes for 3rd and 4th edition d20 System Products. Products not bearing the official logo of Dungeons & Dragons from WotC should go in one of these "d20 System Products" boxes rather than the D&D boxes. This is a macro enabled Excel 2010 file (utilizing Visual Basic) that has the following features: -Dice roller (d2,3,4,6,8...20,x) -Name generator -Combat manager (rolling initiative) -Hit location generator (head, left leg, etc.) -Story line suggestions -NPC type generator -NPC motive generator -Random direction generator (N,S,E, etc.) I find a random generator like this helpful when I have to make responsive story decisions on the fly to unforeseen decisions by the players (or to simply help with overcoming writer's block). Feel free to leave feedback. Enjoy. 0 Rules for using d20 system in a Harn campaign. Published by Columbia Games and uploaded with permission from Grant Dalgliesh.